Do you like company? Do you like late night comfort food? Do you want to have both in one room to help you push through your last papers of the year? We’re joining over 89 schools across the country/world next week who are hosting write-ins at their campuses. 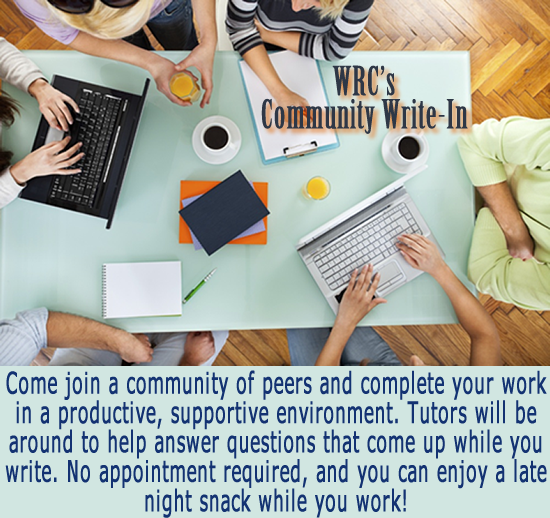 Writing Center tutors will be circulating to work with anyone who wants to talk about their works-in-progress. All you need is paper, pen or a laptop. We do have computers available, but bring yours if convenient. This entry was posted in Information Resources on November 30, 2015 by cmcneil.